Building an email list is the most crucial step you can take when launching a successful internet business. Using a squeeze page has been the most effective way to build a list and it's pretty well documented and accepted that website visitors respond significantly better to popup squeeze or opt-in pages than to regular static pages. For some sites, popup pages increase opt-in and subscription rates by 100%, 200%, even 300% and more! Now, there's been a huge debate about using lightbox popups for lead generation and list building. The main argument against these tools is that they can be very annoying to your site visitors. However there's one undeniable argument in favor of lightbox popups... THEY WORK! And, because they work, you'll find quite a few of the top Internet Marketers use popup opt-in forms and squeeze pages on their sites. There are some great products that allow you to create and display squeeze pages and popups. Some even work with WordPress and work swell to get new subscriptions to a blog. But, for a WordPress sales site, none of the available products met all the needs for a squeeze page product. There is no tweaking of the WordPress code to get your page templates to work and you don't have to know anything about PHP. You can even customize your squeeze items with little or no knowledge of HTML or CSS - the easy customization screens make it a cinch. And, before you save your new creation, you can preview your squeeze item - right in the editor! You only get about 8 seconds to grab a visitor's attention and make a credible offer before they lose focus and move on to something else. Which is why popups work so much better than other alternatives. Most WordPress site owners settle for an opt-in box in the sidebar - mainly because it's quick and easy to do and doesn't require much in the way of coding skills. The text usually says something like "Sign up for my newsletter!". Quick, easy, but NOT good. It's a pretty good bet that in those fleeting 8 seconds after your visitors first hit your site, they won't even notice that sidebar opt-in box. Even if they do, "Sign up for my newsletter!" isn't the kind offer that'll spur them into action. wpOptimum Squeeze opt-in popups solve both of these problems. First, the popup grays out the current window so the popup content is the only thing the reader sees. Some people consider this "intrusive", but intrusion is exactly what you want! If your plan is to "grab" that reader's attention, you've gotta intrude and interrupt their consciousness. Once you've got that attention, there's no need to settle for a weak call to action like "Sign up for my newsletter!". wpOptimum Squeeze lets you use all of the great resources of a web page (color, graphics, text markup, testimonial boxes, video, etc.) to present your offer in the most appealing manner. Instead of the cramped space of a WordPress sidebar, you'll have nearly a screen full of real estate to tout your benefits and entice your visitors. with just a few mouse clicks! But, that's just the beginning. wpOmptimum Squeeze has features you won't find in the other squeeze page/popup products. Of course, these features aren't just window dressing. They're the things that make wpOptimum Squeeze the perfect choice for people who use WordPress as a full-blown internet marketing platform and not just blog. One of the great features of WordPress is the ability - and the freedom - to alter your website's look and feel by simply changing the site's theme. Unfortunately, some of the existing squeeze page products are "theme" based and restrict you to using only their product as your theme. Not wpOptimum Squeeze. It'll work with any theme you choose. Sometimes you'll want to use a landing page as a "squeeze" page for opt-ins. Other times you'll want to have a popup appear on your website's posts or pages. Bottom line, you need a tool like wpOptimum Squeeze that will let you do both. A single popup for the whole site works great for a blog. But, a sales site with multiple products should allow people to sign up to product- and topic-specific lists. With only one popup for the whole site you're stuck. With wpOptimum Squeeze, multiple popups can be handled with ease. wpOptimum Squeeze has built-in support for Aweber, GetResponse, Constant Contact, iContact, and MailChimp. Other providers can easily be integrated with just a few form entries. Include video - even in popups! Video is often the best way to convey the benefits inherent in an offer. It allows you to provide information quickly and visually and it's a great tool to use on an opt-in page. wpOptimum Squeeze has built-in support for .FLV, H.264, (Flash supported) MP4, and YouTube-hosted video. Videos from other hosting sites (Vimeo, Viddler, etc.) can be added with just a few mouse clicks. WordPress delivers amazing function and it's FREE! 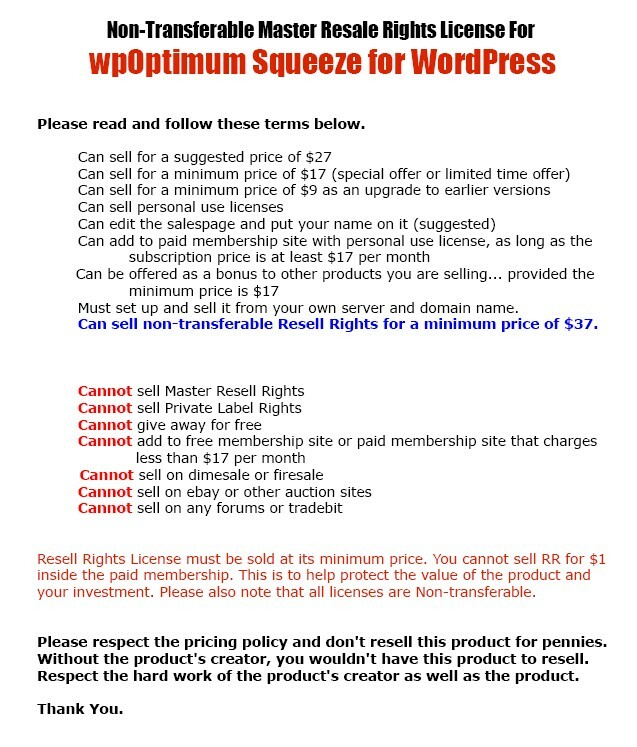 A WordPress squeeze page plugin, if not free, should be very affordable. Create Opt-ins That'll GRAB Your Readers by the Eyeballs! Of course, wpOptimum Squeeze and WordPress as a platform, is pure SEO Magic, because Google LOVES WordPress... you can save money on all future design costs for each of your products too! So for a limited time, I'm selling wpOptimum Squeeze for the ridiculous LOW price of just $27! I don't know how long that price will last. Today, you can have wpOptimum Squeeze for only $27 - tomorrow may be a different story! All you have to do is click the Add To Cart Button below, and pay the CRAZY $27 price tag with PayPal, it's that easy, and it's TOTALLY risk free! Order wpOptimum Squeeze TODAY, and if within 60 days you don't think the package is suitable for you, simply email us and we will gladly refund your money...NO QUESTIONS ASKED! Wait.... There is a reason that the order link above is not working! Because there is a special offer for first 75 Fast Action Takers! Super Special Price For Next 75 Customers! Be One Of The Next 75 Customers, And You Only Pay $17.97! P.S...What are you still waiting for? Go grab this package now before i come to my senses and raise the price another $10! just drop me a message, I will refund your money - no questions asked.